Data gathered by the spacecraft Cassini reveals an icy object about a kilometer (half a mile) in diameter in the rings of Saturn. 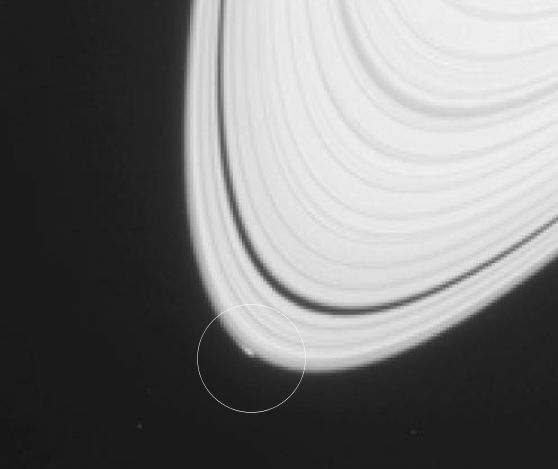 Scientists believe this object may become a moon of Saturn, and we are actually seeing it as it is breaking away from the rings. This object is being called “Peggy”. Cassini was launched to the planet Saturn in 1997. It entered into orbit around Saturn in 2004, and has been gathering information about the planet and its moons. Saturn is the sixth planet from our sun, and has over 50 known moons. It is the second largest planet in our Solar System, large enough that 9 Earths could fit across it. The planet is mainly made up of gases and has several rings around it. The rings are made up of ice, rocks, and dust particles. You can watch videos about Cassini and Saturn here. One year on Saturn (the time it takes Saturn to complete an orbit around the sun) is about 29 Earth years.